Estampas de La Virgen de Guadalupe en papel de 3 3/8 por 4 1/8 de altura. 1 estampa laminada. Colors somewhat more deeper, total width 2 5/8 inches by length 4 3/8 inches. Clearly see all; facial features, hands, detail of robe, gown, border, angel face/ wings, etc. 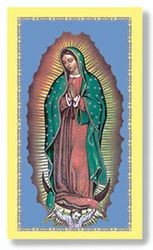 On card back; Novena To Our Lady Guadalupe in crisp, san serif style font, deep brown color. Card laminated with semi thick, clear flexible plastic with 1/8 inch border around card, softly rounded corners, all edges completely sealed. No sharp edges of any kind. Generous sized card makes it easy to hold without difficulty. Pros Easy to see, sturdy but flexible, wipes clean. This turned out to be more than a gift, than just a purchase.